Stress incontinence is defined as involuntary loss of urine on effort of physical exertion (such as cough, sneeze, laugh, lifting heavy objects, sporting activities). 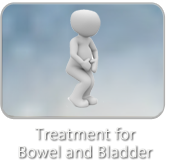 Leakage happens when excessive intra-abdominal pressure is placed on the bladder or if the bladder suddenly contracts and the pelvic floor muscles are not strong enough to counteract the force and hold back urine. However, sometimes it’s not a matter of strength as much as it is poor timing of the pelvic floor muscles in response to this increased pressure. Stress incontinence is the most common type of incontinence in women but it can also occur in men. The most common occurrence in men usually occurs following procedures such as prostatectomy and radiation. See Incontinence Post-Prostatectomy. Practice with sit-to-stand first. Once you’ve mastered this you can start utilizing it with any activity that causes leakage. Remember, if you ever find yourself holding your breath immediately exhale even if you don’t leak! NEVER HOLD YOUR BREATH for any activity including and most especially during defecation (See Defecation Mechanics). One other example is getting out of bed. Do not ‘jack-knife’ out of bed. When laying flat on your back, bend your right knee if you’re rolling to your left, roll on to your left side, then use your arms/hands to push up to sit while exhaling—remember to start the exhale before pushing up to sitting position. Once sitting, follow the steps listed above. If you have a strong urge to urinate before getting out of bed, practice performing 5 quick Kegels before you stand and then walk slowly (do not rush) to the bathroom.